Passing the written test that's required for a learner's permit is a big achievement! Use this guide to help answer some frequently asked questions related to the written permit examination. Do I need to make an appointment to apply for my written permit exam? In most states, an appointment is not required. However, making an appointment before you head to the DMV can reduce wait times and speed along the process. Often, you can make an appointment online. Check with your state's DMV website to see if this is an option for you—if so, it will likely be helpful in getting you behind the wheel sooner! What do I need to apply for the written test? Proof of identity and/or citizenship. Completion of a vision test. Completion of a driver's education program. This is a requirement of some but not all states. Do I have to pay a fee to take the test? Yes, most states will require a fee in order to process the application and take your written test. This fee MAY also cover your road test once you are eligible to apply for your state's driver's license—this is not always the case for every state, so ask your local DMV whether this is an option for you. For most states, written permit tests are typically multiple-choice. Some states have implemented computerized exams, while others have continued the traditional pencil-and-paper format. Please note that for computerized exams, you may have a time limit on each question. Passing scores are recorded as a percentage of right and wrong answers. Passing percentages will vary according to your state. The number of questions featured on the exam will vary according to the state you live in. There are no trick questions on the test. Most states will include a few scenario-based questions that aim to test your application of the knowledge you've gained by studying your state driver's manual and taking your practice tests. Operating a vehicle around pedestrians and cyclists. Driving rules for dealing with emergency vehicles. Passing scores will vary by state. In California, for example, you'll need to answer 37 questions correctly out of 46 questions. 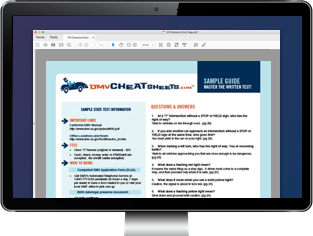 In addition to reading and studying your state's driver's manual, you may also take practice exams online to prepare for the actual test. Some states provide practice exams on their DMV website. Taking a practice test gives you the opportunity to test yourself in the exam format, as well as see what kind of questions you need to better study. Maybe you're a rock star at traffic laws, but need to brush up on your road signs! A practice test will help reveal those weaknesses so that you can turn them into strengths. What are common errors I should avoid? Ignoring your state's driver's manual. While practice tests and other methods of study can help, studying your state's driver's manual is essential for a passing score. Because of stress, nerves, or your testing format, it's common to rush through the test faster than you need to. Reading each question and answer carefully before making your selection can help you to avoid mistakes. Becoming frazzled if you don't know one of the answers. If there is a question you don't know the answer to, don't let it affect the rest of your test. Try to eliminate answers that you know aren't correct, and select what you feel is the best out of the remaining choices. In most states, you will be allowed to retake the test if you don't pass the first time around—so don't let fear of failure sabotage all of your hard work and preparation! Note that some states require a retesting fee for additional examinations. Once you have passed the written permit test and fulfilled all of your state's other requirements, you will be issued a learner's permit, which allows you to operate a car or truck under the direct guidance of a qualifying adult. Check with your state to determine the exact regulations. How long do I have to wait to apply for my driver's license? This varies according to your state, though most will require a minimum number of months before you may apply to take the road test. Completion of driver's education and/or driver's training courses. Completion of behind-the-wheel practice hours. Turning the legal age for full licensing.